I was recently at a conference where some of the physicians were speaking highly about shock wave therapy. Many of these physicians were in a similar field of medicine as myself, and trying to help people with their pain. This was not the first time I had heard of this modality in the sports medicine and pain management arenas. I finally decided to take matters into my own hands, and put some of the information about extracorporeal shock wave therapy (ESWT) into Treatment Scores in order to see the actual net treatment benefit of this modality for treating pain. I first started out with a search for generalized pain and ESWT. This search was way too broad and gave me hundreds of articles to look through. I then narrowed my search down many times, until I landed on plantar fasciitis and ESWT. I decided to use 2 different articles. As I put these studies about plantar fasciitis and ESWT into the Treatment Scores system, I knew right away that this treatment was not going to score very well. First of all, pain is not a visual symptom, and thus can only be measured subjectively. That being said, unless a person's pain is completely gone, the pain level, subjectively, rarely tends to decrease substantially. This is partially due to factors that play a role in a person's pain such as chronicity of pain, mental state at the time of visit, external stressors in the person's life, etc. As you can see below, in the two studies evaluating ESWT and it's effect on plantar fasciitis, the treatment grade for ESWT is only a "D" for both studies, despite having slightly different overall scores. The above studies were actually good studies. The reason the treatment grades were so low is due to the combination of only a 20-30% improvement in pain levels, the small patient population treated, and the short follow up time. As the future of Treatment Score progresses, we will be able to compare multiple treatments for a single disease and a single treatment for multiple different issues. Treatment Scores allows us to assign a Treatment Grade to a variety of different modalities and diseases, and place them on similar playing fields. It allows use to compare big studies to small studies, good studies to poor studies and more. As time moves forward, this advancement in grading the different aspects of each study will help us to better understand and compare different treatments for different diseases. See the disclaimers below. Once again, a study has driven home the fact that what everyone really needs to know, the treatment effects of treatments, is often ignored. This is why we invented Treatment Scores. Treatment Score represents the net treatment benefit for the patient. Treatment Scores are the numbers you have always needed to know. You get diagnosed with an illness. You need to see a list of treatment options. You need to see the Treatment Score for each treatment. Then, you can have shared decision-making with your physician with true treatment transparency being present. David Chavalarias, PhD; Joshua David Wallach, BA; Alvin Ho Ting Li, BHSc; John P. A. Ioannidis, MD, DSc. Evolution of Reporting P Values in the Biomedical Literature, 1990-2015. JAMA. 2016;315(11):1141-1148. doi:10.1001/jama.2016.1952. We have been teaching physicians how to produce Treatment Scores. You create a diagnosis. You create a list of possible treatments for that diagnosis. You create a Treatment Score for each and every one of those treatments. 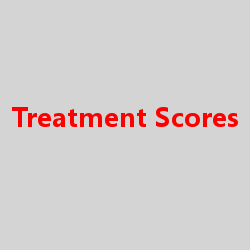 The Treatment Score represents the net treatment benefit for the patient. Treatment Scores are not simple. The mathematical problem often involves 10,000 variables. Some of the routine things that have been done in the past have to be done in new and better ways. To bring science-based medicine to the masses, the mathematics has to be simpler. That's why we use Easy Basic Math (EBM™). The situation is like the early days of the computer. Back then you had to know machine language to use a computer. Then Xerox, Apple, and Windows came along and put a graphical user interface (GUI) over machine language and suddenly everyone could use a computer. This disrupted the entire industry and changed the world for the better. We are doing the same thing with Treatment Scores. We are putting a graphical user interface over the organization and mathematics of science-based medicine. This means that we will have treatment transparency - really for the 1st time in history. We will also have the ability to do true shared decision-making between healthcare providers and patients. Patient input will actually matter. Currently, we are teaching physicians one-on-one how to do Treatment Scores. Soon, we will branch out to other healthcare providers and health bloggers. 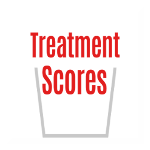 We have online tools at TreatmentScores.com that we use for instruction to teach the mathematics of Treatment Scores. Do You want to be the Greatest Possible Evidence-Based Medicine Physician? Do you want to be the greatest possible evidence-based medicine physician? If so, you have to go to the data yourself. You have to stop following “authority bias” or “eminence bias.” You need to end “paternalism” and “maternalism” in medicine, where you act like the patient’s father or mother and tell them what to do instead of helping them decide what they WANT TO DO based upon all the options and scientific information. You need to combine evidence-based medicine and shared decision-making. You have to give patients real informed consent. You have to join the movements to put patients first. You need to be aware of the E-patient movement, the spoonie (chronic illness) movement, the patient power movement, the shared decision-making movement, and about price transparency and product transparency for patients. What we do is like putting a graphical user interface over science-based medicine. In the past, very few people could use a computer because it did not have a graphical user interface. Right now, very few people can do science-based medical reviews of the literature, because they don’t have the graphical user interface they need to organize and digest medical statistics. We are changing all that with Treatment Scores. What are the treatments to quit smoking? What is the evidence behind your favorite diet? There are 130 treatments for insomnia. Can you give the Treatment Score for each one? There are 57 treatments for an acute migraine headache. Can you give the Treatment Score for each one? You are diagnosed with cancer. You can have surgery, chemotherapy, radiation, immunotherapy, sometimes hormone therapy, or many combinations of all of these treatments. Can you give the Treatment Score for each treatment? Whenever physicians, nurses, and other allied healthcare professionals do Journal Club they should be focused on coming up with Treatment Scores. Whenever any medical review article is done the focus should be on Treatment Scores. Continuing medical education should be focused around Treatment Scores. How is it that you don’t know the Treatment Scores, the net treatment benefit for each and every treatment? Do you know your gross income and your net income? Does your business know it’s gross income and net income? How is it that what really matters to the patient continues to be a secret? Why don’t we know “the gross treatment benefit” and the “net treatment benefit?” Why don’t we know the Treatment Scores for every treatment? Support the Treatment Score movement and help us help all 7.3 billion people who live on planet Earth. 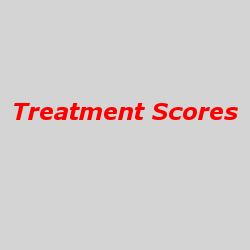 The Treatment Score represents the net treatment benefit of a treatment for the patient. To understand medical articles when doing journal club, readers of medical articles need to understand clinical statistics. Here is a favorite clear video tutorial about the standard deviation and the standard error of the mean. We like to use Easy Basic Math (EBM™) so that statistics can be brought to the masses. As you will see in a future post, these calculations can be made easier by using absolute values instead of squares and square roots to get similar indicators of dispersion about the mean. We could make this simpler. The standard deviation and the standard error of the mean both square the difference between the mean and each number to get rid of negative numbers. There is really no reason to do this anymore. All you need to do is use the absolute value of the difference of n minus the mean. You lose a great number of people once you start squaring the numbers and doing square roots. With easy basic math, EBM™, you can start producing the average difference from the mean, and you could report the mean +/- the mean average difference from the mean (MADM) as a measurement of dispersion. Across America yoga has become more and more popular. Those who practice regular yoga claim that it helps with things such as pain, anxiety, and overall better sense of well being. As a PM&R physician, I have often prescribed yoga as a form of exercise and healing for my patients. Over the past weekend, I decided that I needed to quantify the net treatment of yoga on some of these claims. The first article I found was one on balance and fall risk. I decided this was a good place to begin, as falls are a significant cause of morbidity in the elderly. I began with putting both balance deficit and falls into the diagnoses that we are going to measure. The article I read showed a 16% decrease in the patients' "fear of falling" and an 18% improvement in balance after only 8 weeks of yoga. These numbers are statistically significant, as they will provide patients with an overall improved quality of life. As you can see below, however, with only an 18% improvement in balance, the Treatment Grade for yoga is still only grade "E". The reason that yoga as a treatment has such a low score is that an 18% improvement in the main outcome measure is actually not that high when compared to other treatments for other diseases. Some treatments for some diseases are nearly 100 percent effective or Grade A. But many treatments in medicine are actually Grade C, D, or E, when you actually take a hard scientific look at them. Though there seems to be no bad side effects from doing yoga, we do have to compare yoga as a treatment to other treatments for balance deficits, such as a medications. We would want to know if a medication was greater than 18% effective for treating our diagnosis, as that would play a role in our decision to take the medication or not. To repeat, the reason that yoga as a treatment was only given a grade of "E" is that is what the improvement was on the main outcome measure scale that we used. There was a control group of inactive people. In the future, a placebo group, and a group who performed a different type of exercise than yoga would be a good comparisons to yoga. Yoga is a promising treatment for patients who fall and for those who have balance problems. I will continue to read about yoga and put those numbers in the STAR™ Blocks. STAR™ stands for statistic and a reference. This way, we will be able see what other good medical benefits yoga may actually have and compare those benefits to other treatments for other conditions. The "art of medicine" is not just the physician's bedside manner. The real art of medicine is handling missing data. Physicians often do not have enough data to practice medicine in a scientific manner. Physicians need to join together to start doing studies that will produce missing data they they need almost every day. When I talk with physicians, it is sometimes surprising how little they know about medical statistics. This is certainly not the physicians' fault. A big part of the problem is that every practicing physician is not doing clinical studies as part of their daily life. All physicians should probably be involved in clinical research all the time. There are far too many unanswered questions in medicine. We need to start answering them. Vitamin D3 supplementation has become more and more popular in recent years. It almost seems as if it is the new fountain of youth. Many practitioners had taken to checking blood levels of vitamin D3 in patients, and advising patients to subsequently take the supplement for it, if levels are low, or even just borderline low. Vitamin D3 is thought to play an important role in a multitude of processes in the body. It is thought to help regulate hormones, digestion, and even play a role in the development of osteoarthritis. More and more practitioners are telling their patients to stop taking extra calcium, and to only supplement with vitamin D3, as this may be enough to keep your body's calcium stores at optimal levels. I chose to see how vitamin D3 played a role in actually maintaining knee cartilage in osteoarthritis. I took one high quality, randomized controlled trial and put together the numbers and evidence, in the Star BlocksTM. By putting the evidence into the Star BlocksTM, I was able to really compare the effect of vitamin D3 supplementation and placebo. It quickly became obvious that vitamin D3 did not significantly increase the thickness of knee cartilage by much more than placebo, and thus did not alter the long term course of knee osteoarthritis. It also became readily clear that vitamin D3 did not significantly decrease knee pain, as compared to placebo. Thus, treatment of knee osteoarthritis with vitamin D3 has the same treatment gradeTM as placebo. If you are wondering why the treatment scoreTM for vitamin D3 is actually lower than that of placebo, it is for a few reasons. One is that there was no significant improvement in either pain or cartilage volume over placebo. You would still think that even though these results are not statistically significant, vitamin D3 should not receive such a low score. Well, upon further examination, vitamin D3 did have a few more serious side effects than placebo, such as cardiac arrhythmia and death (1 case). For this, I elected to give vitamin D3 a lower overall treatment scoreTM than placebo.